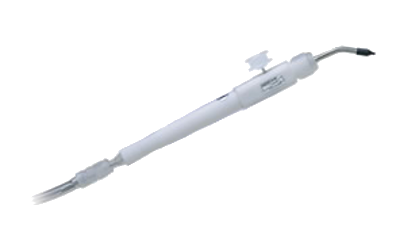 Vacuum wand without tip for handling small objects, including semiconductor dies, components, etc. Manufactured from PTFE. The valve is normally closed, so press the button to pick up. The vacuum tube connector allows push-on connection to any flexible tubing from 2.5 mm to 4 mm ID. Flexible tubing is available for use with this wand (part numbers 851-L, 851-M and 850-M). The tube connector has a quick connection feature that allows wands to be interchanged rapidly. Compatible with all nozzles, suction cups and slit tips (shown with typical nozzle).